In this final reflection in the Names of Jesus series, Fr. 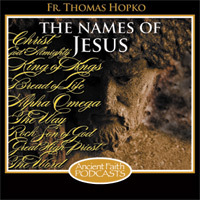 Tom Hopko shows how the Name of Jesus is supreme. In this next to last episode in the Names of Jesus series, Fr. Tom takes us to Hebrews 12 where the RSV tells us that Jesus is the "Pioneer and Perfector" of our Faith. As we continue with our reflections on the names and titles of Jesus, we read in the twelfth chapter of the Letter to the Hebrews… And here I must emphasize again: read carefully Hebrews 12. It’s probably the most perfect place in the New Testament that describes what our Divine Liturgy in the Christian Church is, the celebration of the Holy Eucharist, and what we come to when we come to church and gather as Church. Holy Scripture tells us there is "One Mediator between God and men" (I Timothy 2:5). Fr. Tom Hopko teaches on Christ as our Mediator and Intercessor. Jesus is the Head of the Church and the Head of the Body which is the Church. Fr. Thomas reflects on this title for Christ in this new episode. Several places in Holy Scripture, there are architectural images given to describe our Lord. Fr. Thomas reflects on them in today's episode. We know that Jesus is the Healer of soul and body, and the New Testament is replete with accounts of his miraculous works. But how do we differentiate between Jesus as the Healer and Jesus as the Physician? What is the testimony of the Lord Jesus Christ as described in the Book of Revelation? Fr. Tom Hopko explores this with us in his next episode of The Names of Jesus. As Fr. Tom comes close to the end of this series, he explores with us the name of Jesus as Pastor and Bishop. Fr. Tom continues his series on the Names of Jesus by exploring two names that we do not usually associate with Christ.